The galaxy is in chaos and someone just needs to put order to it! 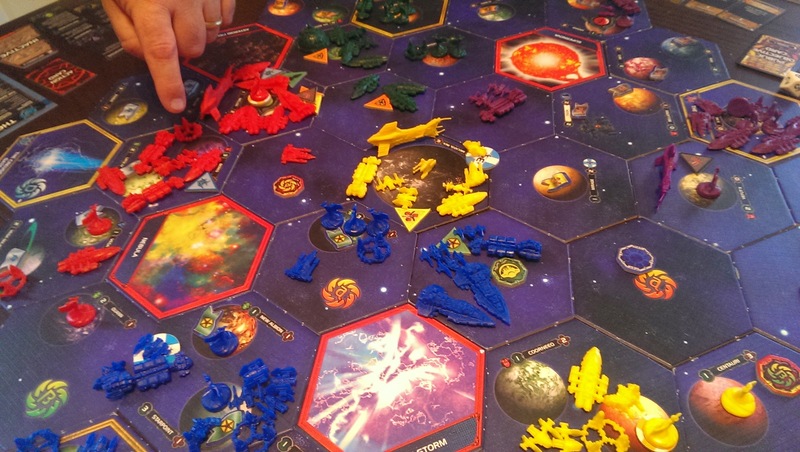 Twilight Imperium is probably my favorite game. I think I’ve gotten more hours of enjoyment out of this single game than any other game in my collection. Of course this is in large part due to the 8-to-12 hour duration of a single game, since I only get to play it a couple times a year. 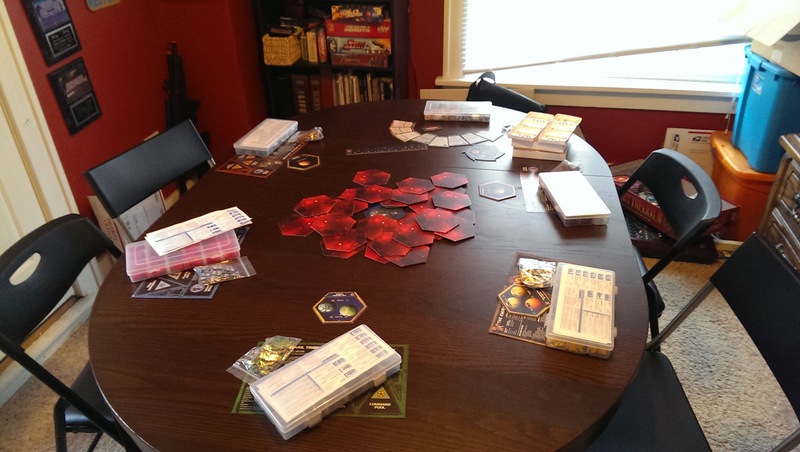 However, I’ve also spent plenty of time outside of actual gameplay studying rules and FAQs (for my enjoyment), and creating tools to assist in gameplay and organization of the box. 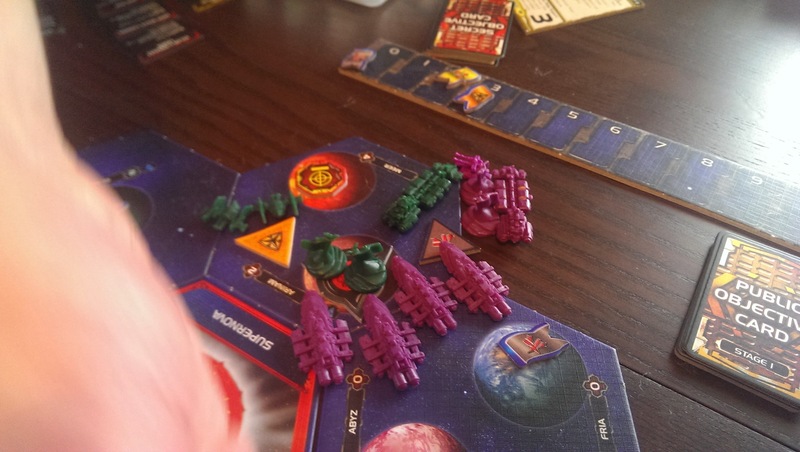 This past saturday I was as happy as a clam at high tide to get another game of Twilight Imperium out on the table, the first since my beautiful baby daughter was born. And oh, what a doozy. What follows is a summarized recap of the day’s adventures, with pictures, if you’re into that sort of thing. 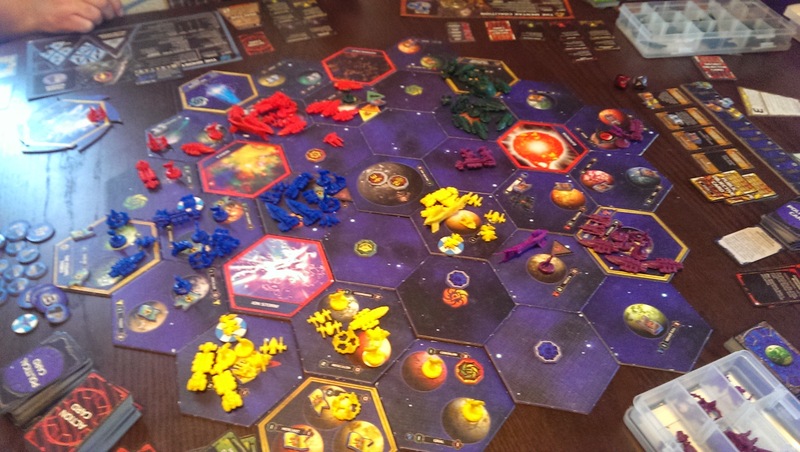 It was a slow, deliberate start as always… each of us casually reaching out to conquer nearby planets while trying not to seem aggressive towards our neighbors. Who wants to start a war so early, anyways? But planets are currency, and currency is key to victory. We all had preliminary secret goals to focus on, so no one wanted to take Beaurocracy – the strategy card that unlocks new Objective cards for scoring points. Probably a poor choice on someone’s part, but it’s difficult to pass up those ever-so-useful Strategy cards that actually GIVE you something. 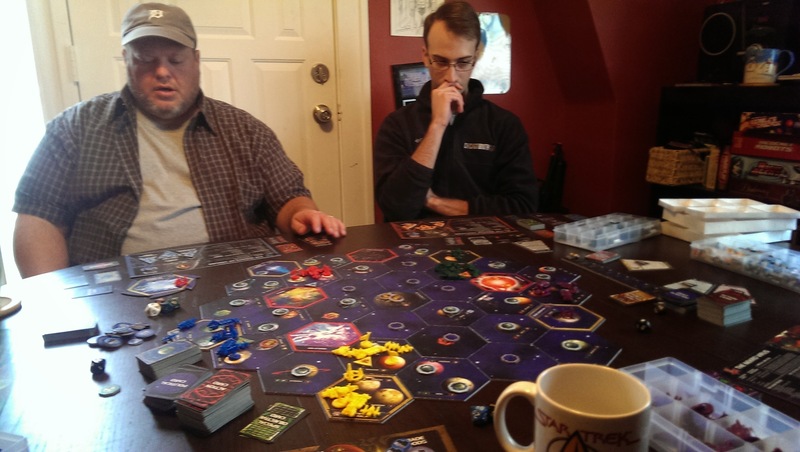 Myself, playing Yellow/Hacan actually jumped out the quickest, using the Diplomacy strategy card in round 1 to conquer an extra sector in addition to the two systems I conquered with carriers and ground forces. Unfortunately I ran into a problem that plagued me the whole game: after those 5 initial new planets, I had nowhere to go. To the left, Duane/Green/Ysarril controlled the planets adjacent to his home system, reasonably. Then there as an Ion cloud. Forward and to the right? Empty space. A whole line of empty space between me and everything else. Waiting on the other side of that line was the fearsome and aggressive Nekro Virus/Purple/Bryan. Duane strikes fear into the heart of his opponents. At last, first blood. Ken/Red/Ghosts of Creuss wanted to control a planet adjacent to another player’s home system. He stretched out in both directions, perhaps foolishly. To his left, Green/Mentak/Dan felt antagonized by Ken’s movements, and so pushed him back out of the system. 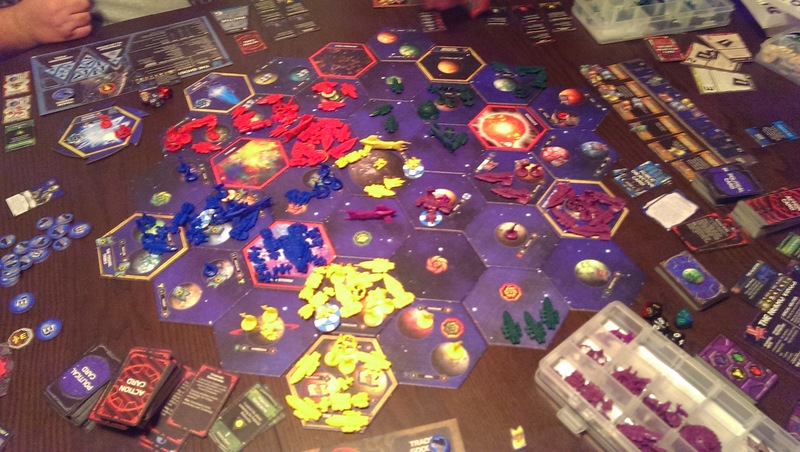 Ken/Creuss tried to make arrangements with Duane/Ysarril to hold the planet for long enough to score his points. Duane initially agreed, but – surrounded by the Ion storm and a Nebula, soon felt trapped in his own way. Unable to reach the planets he wanted near Creuss, he instead took back the vulnerable neighboring planet before the Ghosts could score. Ken/Creuss was, shall we say, less than pleased. In the meantime, Hacan solidified some trade agreements and pushed into some tech to boost those trades further, and I was rolling in a huge boatload of trade goods, more than I’ve ever had before. Without planets to expand to those trade goods were completely invaluable, and were used to bribe some other races away. The Nekro Virus played quietly, sending small attack fleets out just strong enough to get at least one kill – enough to score Nekro free technology, stolen from their opponents. My own Hacan fleets ventured out into empty space, discovering an ancient starbase that was worth 1pt while under control. This was after round… 2 I believe. Maybe 3? It’s easy to lose track. Ken/Creuss’s anger caused him to build a MASSIVE fleet, which resulted in some tense standoffs. 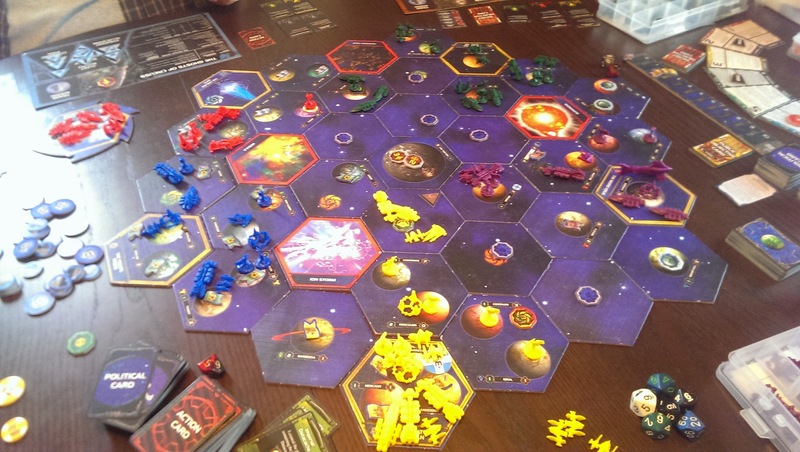 In the middling rounds, I was still pretty much blocked off from expansion so I held on to my trade goods and focused on the thing I could do next: start to accomplish objectives. The Beaurocracy card was actually a very nice grab in round 4, with 3 bonus tokens granting me addition command counters I needed to stay active on the board. I also focused on building up a defense fleet, as well as making preparations to quickly expand to grab a few systems neighboring opponents homes for my own points. Unfortunately that never came to fruition, as the threat of retribution was too great. Mentak/Dan and Nekro Virus/Bryan landed in a few skrimishes, mostly resulting in Nekro taking things from Mentak. How that pleased Nekro so, but Mentak didn’t want to get stuck fighting Creuss and Nekro so he played the appeaser and did not escalate the aggression. Can you spot all the wormholes? My focus was trying to score my secret objective, while also maintaining hold of the Beaurocracy strategy to keep scoring normal points where I could. If I could stay ahead, the Imperium Rex game-ending Objective card would be my ally. Unfortunately I made a mistake, and chose a new Objective that I could not accomplish that round. Though I was able to score another objective immediately, I couldn’t score a second objective that same round. The objective I put back was one that I couldn’t have accomplished at the moment I looked at it, but after I took Mecatol Rex later that round, it would have been achievable. Having more influence than your neighbors is difficult to do but Mecatol Rex with 6 influence built in can help you swing it. Yes, I took Mecatol. No one seemed to be after it and the influence turned out to be quite useful – I knew that Objective would show up sooner or later. At this point I started bribing Nekro Virus heavily to ignore me. In the meantime, Creuss and Ysarril managed to work out their issues and form a stronger peace treaty, actually setting up a stack of counters to track the duration of an agreed-upon ceasefire. Activity between Creuss and Mentak, however, escalated slowly. But still, most skirmishes were small. No one wanted to lose a whole fleet at once. 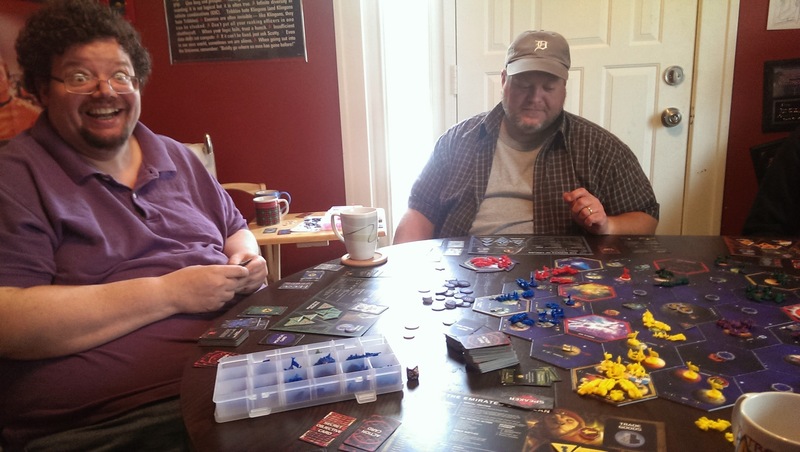 I knew that Imperium Rex card was hanging over my head so I tried really hard to figure out how to get my Secret Objective – control systems adjacents to 2 other players’ home systems – without igniting a terrible backlash. Unfortunately that never happened. And I had to spend some more time bribing Nekro virus to leave me alone – spoiler alert, don’t be the race that sits next to Nekro Virus. Though there were a few things I wish I had done differently, the last round was filled with mistakes from all around the table. First of all, we allowed Nekro Virus/Bryan to grab Beaurocracy even though he was a point in the lead. That wasn’t my fault – I had to choose last. While everyone was gearing up for war – mostly to invade me in my massive home defensive fleet as well as Mecatol Rex, I should have fired my PDS at the Nekro’s command ship. I had 4 PDS in range and while it was no guarantee, I might have taken him out. In the picture above, you can see that purple’s command ship was controlling the 1-pt ancient base. Had I destroyed it, the point would have been lost, pulling Nekro back down to a tie, neutralizing Imperium Rex for the time being. Unfortunately, I didn’t do that. Nekro activated Beaurocracy, found the Imperium Rex card, and ended the game before any of our massive invasion fleets got underway. Overall, this was probably one of the best TI games I’ve played, aside from the somewhat anti-climactic ending. On my end, I actually worked on getting trade goods which turned out to be quite useful – even without playing Hacan, I will likely pursue some of those more actively in future games. I also built a lot more fighters and ground troops, and thus had a more solid defensive position – fighters are easy to replace, and with 8-10 fighters in a fleet you have a decent chance of doing some damage with them before they go down. At the very least, those big stacks of plastic are a big deterrent. 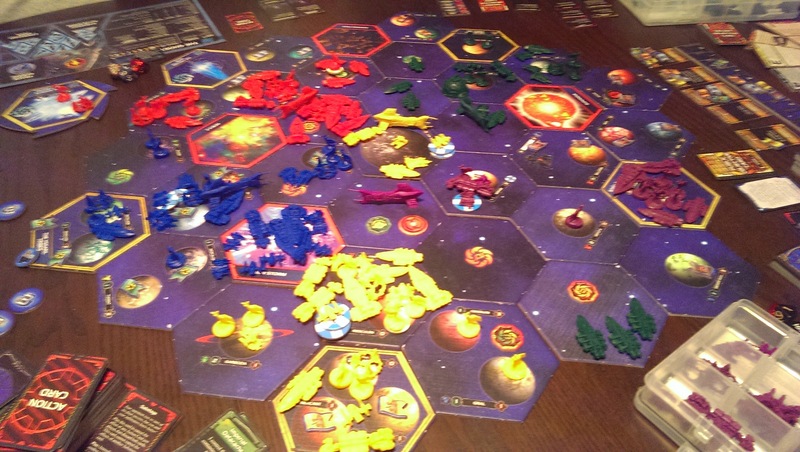 We had quite the dynamic game filled with shifting alliances, and a lot more smaller-scale battles rather than a few larger, deterministic ones. I still need to get people to focus on the points more. It’s easy to forget Beaurocracy when you want to research new tech or get trade goods, but that card is really key in driving the game forward. Objectives are everything, not just secret objectives. Also important: keeping Beaurocracy out of the hands of the lead player to prevent them from ending the game early in their favor. It can’t always be done, but in this case there was no reason he couldn’t have been stopped. At least we would have seen some epic battles before the end. What a game. What a great game.